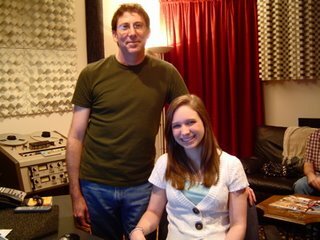 My friend, Maureen Doherty, recommended that I speak with a young lady that needed a vocal demo, Olivia Lane. Olivia is an aspiring actress/singer who already has an impressive resume (she is 16). I usually don't do demos, but Olivia seemed talented, motivated, and was a really fun person to be around. Her dad, Brent, and mom, Mary Ann, were equally charming. What sealed the deal for me was that they wanted to do cover songs. Now it's been a long time since I've busted a move on a cover song (Carolina Bedetta's Welcome to the Jungle, on the soundpage of this site). We negotiated a long list looking for songs that were very recognizable, suited Olivia's personality, and were not 'untouchable' in the sense that the original artist/performance would just invite a negative comparison to the original. The challenge, in my mind, was to tweek each song's style so that the hearing of the song would create a mild surprise once the tune was recognized in it's new form.